An elderly man had serious hearing problems for many years. He went to a doctor and the doctor after checking him realised that he would need hearing aids that would enable him to hear 100%. 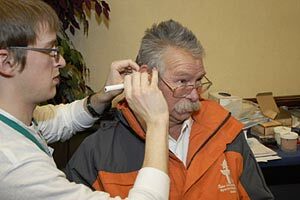 The elderly man went back in a month to the doctor and the doctor said, "Your hearing is perfect. Your family must be really pleased you can hear again." To which the gentleman said, "Oh, I haven't told my family yet. I just sit around and listen to the conversations. I've changed my will five times!"